The low land over which the causeway passes was flooded in 1944. Many American paratroopers drowned here. Others were shot by snipers as they waded across the marsh. The road was important as the Utah invasion forces pushed west across the Cotentin Peninsula. Captured intact without losses on D-day it was left unguarded to be occupied later that day by Germans recognizing its strategic value. The defenses occupying the farm buildings to the east end, foxholes along the causeway, and the western bank took a very heavy toll on the 82nd Airborne over a three day period. 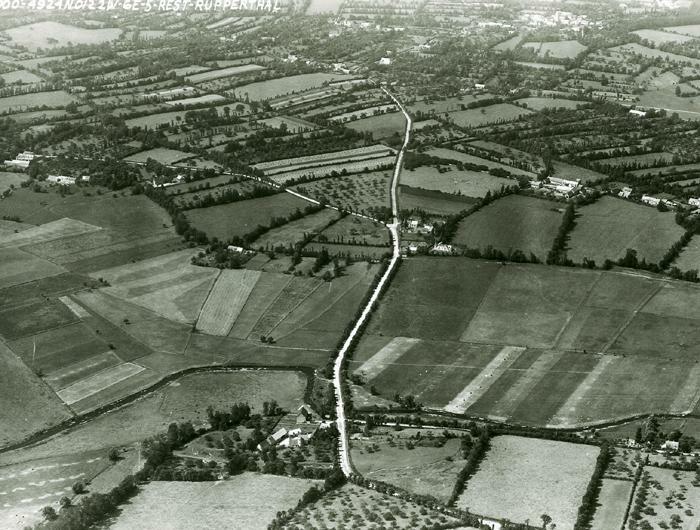 General “Jumping Jim” Gavin’s wartime foxhole is preserved along the road in the foreground. The “Iron Mike” airborne memorial is in the field across from the Leroux Manoir [foreground] overlooking the Merderd River valley.